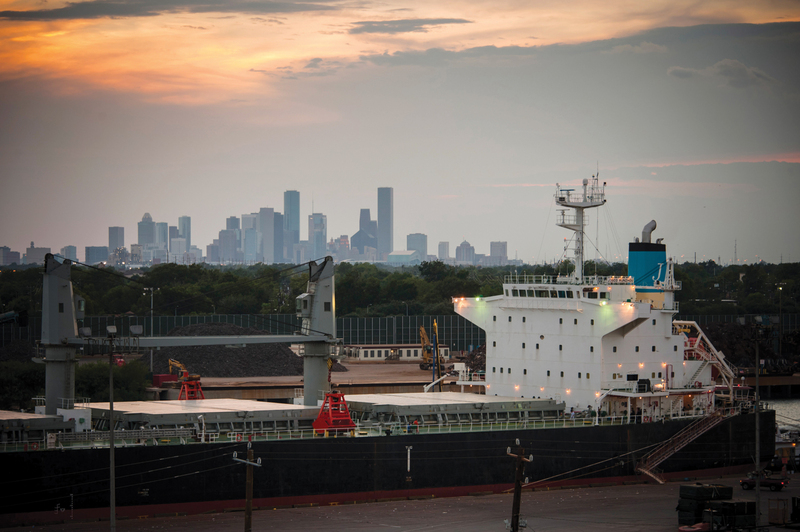 Port of Houston Authority officials are in celebration mode after reaching an historic milestone with the completion of dredging work at the Barbours Cut Container Terminal. The completion opens the facility to begin handling vessels with a 45-foot operating draft. With the conclusion of the dredging project, the Houston Pilots Association (HPA) gave its authorization for the port to begin receiving vessels with the deeper operating draft. According to a study by the U.S. Army Corps of Engineers, the improvements at the terminal will result in more than $900 million in combined local, state and national economic benefits over the span of the next 50 years. Last year, the Port Commission awarded a $68.9 million construction contract to Orion Construction L.P. for Bayport and Barbours Cut channel and terminal improvements. The work included modification of the existing Bayport and Barbours Cut channels and berths, and increasing capacity of a federal placement area for future dredged material. While the Barbours Cut channel is complete, dredging at the Bayport channel is scheduled to be completed in 2016. The Port Authority handles 67 percent of all containerized cargo in the U.S. Gulf, and Barbours Cut is its largest container terminal. Port Commission Chairman Janiece Longoria said the dredging project was funded through its operating income. “This investment demonstrates our commitment to drive economic prosperity for the region and further ensures that the Port Authority is America’s distribution hub for the next generation,” Longoria said. Both channels adjacent to the Barbours Cut and Bayport terminals are being dredged an additional five feet to match the capability of the Houston Ship Channel. The dredging project also widens or realigns the channels to better accommodate the larger ships that are expected to call with more increasing frequency in the near future. The USACE issued dredging permits last year for the Barbours Cut and Bayport Channels and approval of its assumption of maintenance agreement of the channels. The dredging projects were initiated after the Port Authority completed a master plan for upgrades to the Barbours Cut Terminal in 2011, which included dredging the Barbours Cut channel and improving the capacity of the container yard. The completion of the dredging project, along with the recent delivery of four Super Post-Panamax wharf cranes to accommodate the larger vessels calling at Barbours Cut, allows the facilities to handle some of the largest vessels in operation today. Officials say the new cranes are scheduled to be fully operational later this fall. After all of the improvements at Barbours Cut are completed, terminal capacity at that facility is expected to more than double from 1.2 million twenty-foot equivalent units (TEUs) per year to 2.8 million TEUs per year. In addition to approving assumption of maintenance (AOM) at the Bayport and Barbours Cut terminals, the Corps of Engineers announced the AOM of the Jacintoport Channel. The Corps of Engineers will now be responsible for the cost of channel maintenance dredging, which officials say will save the Port Authority about $1 million in dredging costs over the next decade. The AOM for Jacintoport, combined with the anticipated AOM for Barbours Cut and Bayport channels—once the work at Bayport is completed—will relieve the Port Authority of more than $50 million in potential dredging costs over the next 10 years.